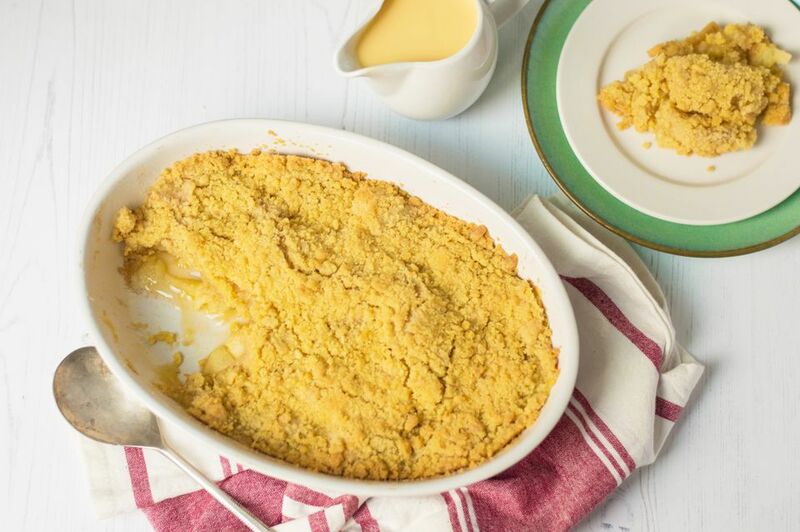 Puddings and desserts are the backbones of British food and they are renowned throughout the world and there is no more a quintessential pudding than a traditional British Apple Crumble. Crumbles come in many guises and can be both sweet and savory but apple is the most popular and no wonder, it is delicious. A light crisp crumble is the perfect topping for delicious British apples which in the autumn, and winter are at their best. To make a crumble you can use Bramley apples, considered the best apples for cooking because of their balance between the sugar and acid. Bramleys contain more acid and less sugar than other apples, so they keep their tangy flavor when cooked. The apple crumble can, however, be made using other apples but avoid the really hard varieties such as the Granny Smith, they don't break down the same way and can stay a little crisp. And, when the pudding is made and served, don't forget the custard. Note: while there are multiple steps to this recipe, this apple crumble dessert is broken down into workable categories to help you better plan for preparation and baking. Peel, core, and chop into chunky pieces. Don't cut the apples too small or they will just disintegrate, especially the Bramleys. Place the apples into a shallow baking dish, approximately 9 x 7 inches. If using the cinnamon, mix with the 2 tablespoons of sugar and sprinkle over the apples. Otherwise use just the sugar, then put to one side. In a large baking bowl, place the flour and sugar. Cut the butter into small pieces and add to the bowl. Rub the butter into the flour and sugar until you have a very coarse mixture. Don't worry too much about getting it even, as this is quite a rustic dish and works well with an uneven texture. You can also make the crumble mixture in a food processor. Place all the topping ingredients into the processor and process on pulse until you get a coarse mixture but be careful not to over-mix. Sprinkle a good layer of crumble topping over the apples, try to work on a depth half that of the apples. Too thick and the middle won't cook. Place into the preheated oven and bake until golden and you can just see the apples bubbling through from underneath - about 30 minutes. Caster sugar is also known as fine sugar. Golden caster sugar is unrefined and tends to be more golden in color, Don't worry if you can't find it, use ordinary white caster sugar instead.